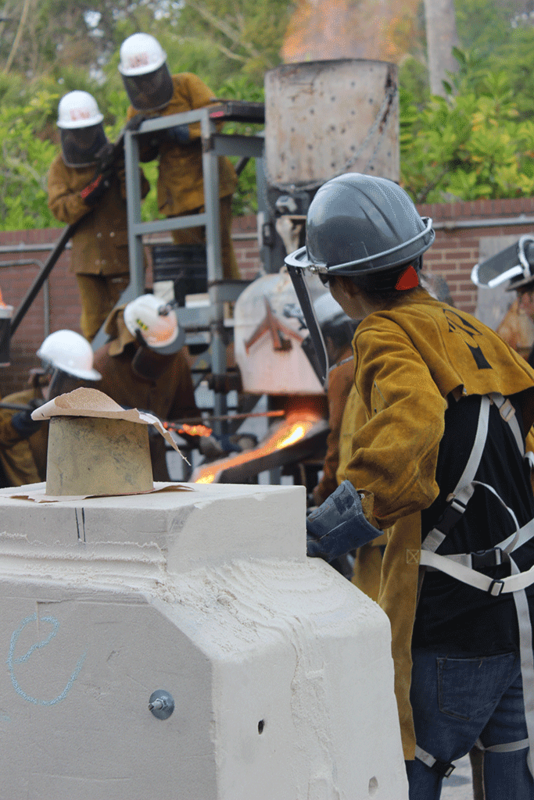 Every spring and every fall, the sculpture students at the University of North Florida participate in an iron pour. 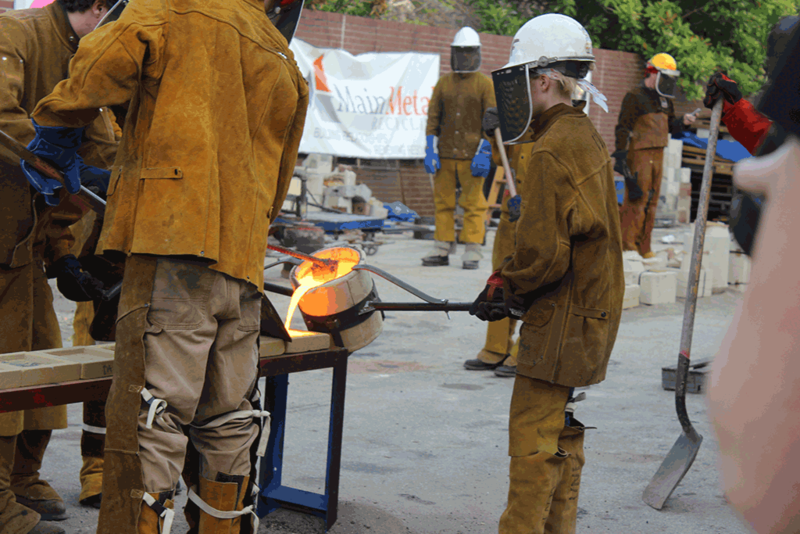 This event is also open to the public and it is free to attend, but there is a small fee if you want to produce a cast iron piece of your own – right here in Jacksonville, Florida. 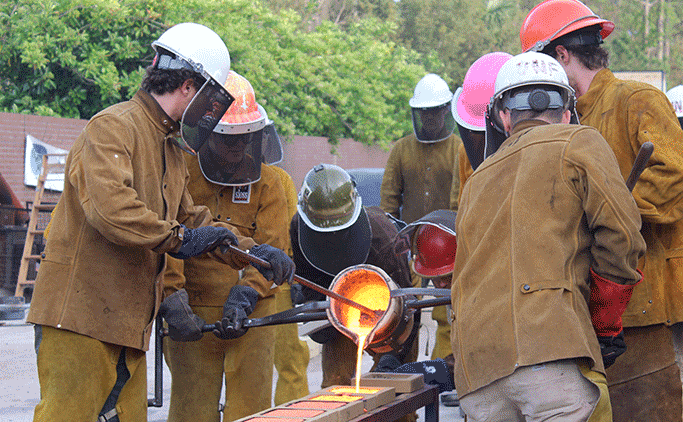 The red-hot iron is carefully poured in to each mold along the line. The scratch blocks will need to be filled completely and evenly for the final pieces to come out right. When cooled, the iron will take the form of whatever has been carved – or scratched – in to the mold. 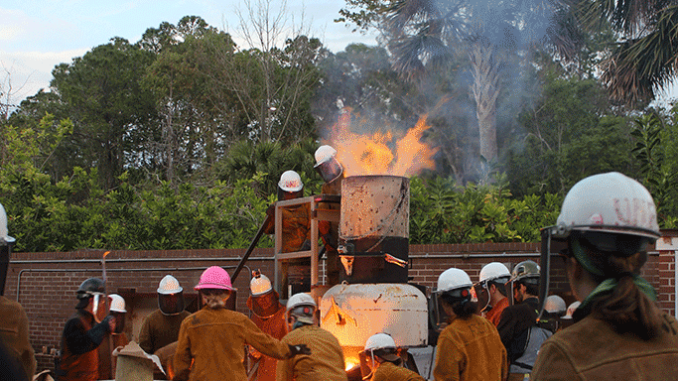 Students watch intently as the furnace is tapped for additional iron. Any mistakes could ruin the art they have worked on – or worse, cause serious injury. Luckily, the professors enforce strict safety standards and no one gets hurt. Unfortunately, the art is not always so lucky. The large block mold shown in the foreground of the above picture was not able to vent quickly enough and ended up cracking under pressure. While an impressive visual display, this also means that all of the student’s hard work will only be rewarded with a bittersweet learning experience. Like Icarus, a true artist is always approaching the very limits of what is possible – and sometimes, overshooting that limit. A bit of molten metal escapes from the furnace, creating a chaotic scene. 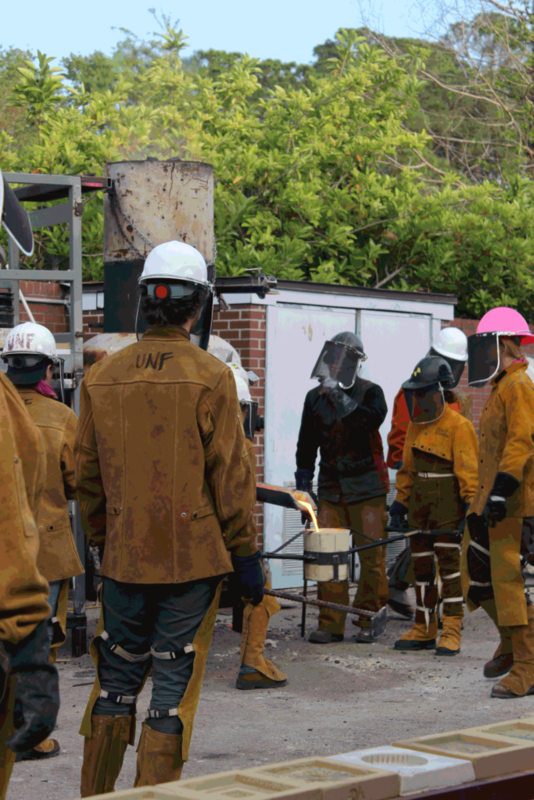 Some students dodge molten metal while others prepare to douse it with buckets of sand. It is vital that all attendees wear proper safety gear including leather jackets and chaps, helmets, and visors. Again, no one was injured, but that is because of how seriously safety must be taken at all times. And victorious students carry another batch of melted metal for the remaining molds. 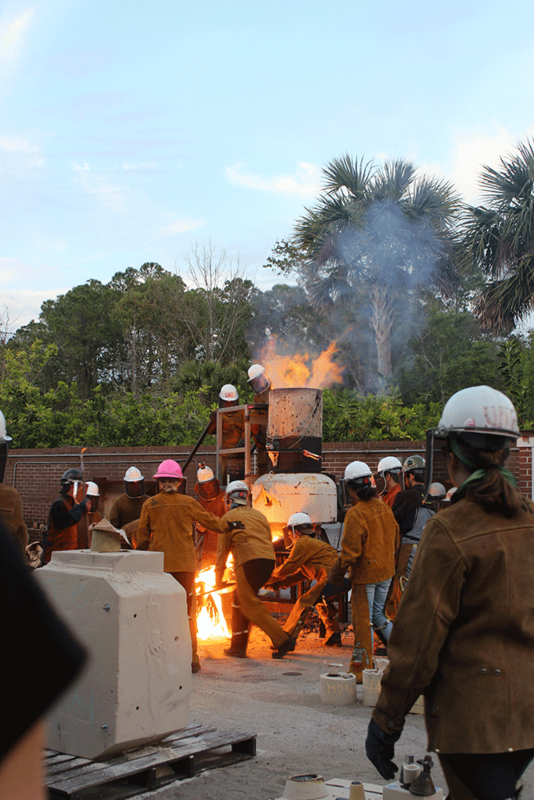 Students continued pouring iron at UNF well past sunset and in to the night. 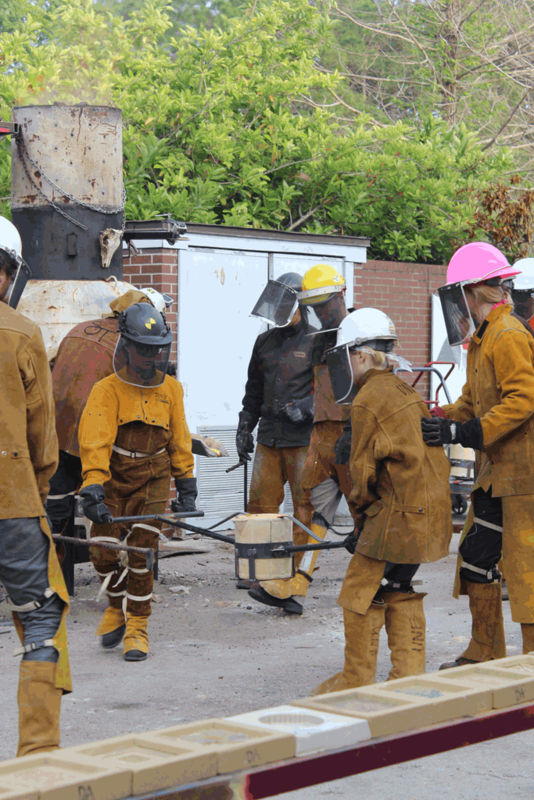 After another day or two, the molds and metal will have cooled down enough that participants will be able to open up their work and reveal what forms took shape. Some pieces will be cleaned up and turned in to unique works of at – and others will fail to turn out right and prompt the sculpture to re-evaluate their technique and methods. Those who are successful with a smaller piece are likely to be tempted in to trying something larger and more complex. 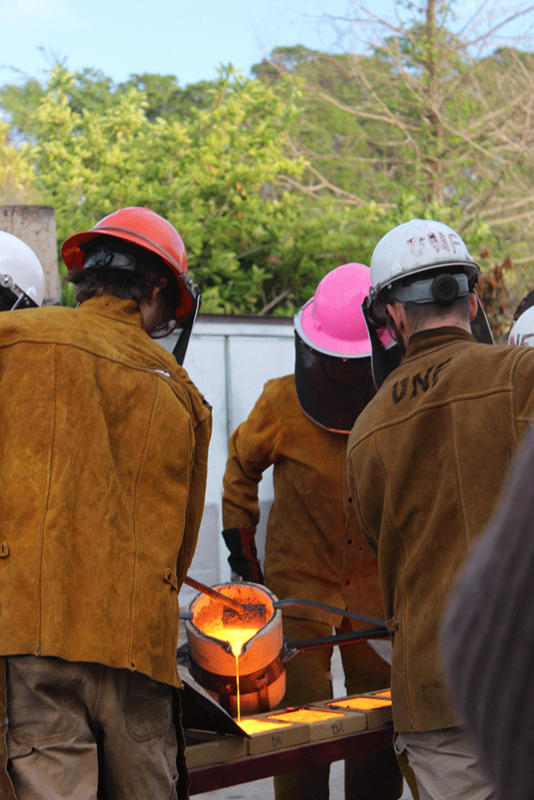 As stated earlier, these iron pour events are totally free to attend and open to the public. It’s a great chance to experience art from behind the scenes, and if you’re really interested you can even participate with a piece of your own. 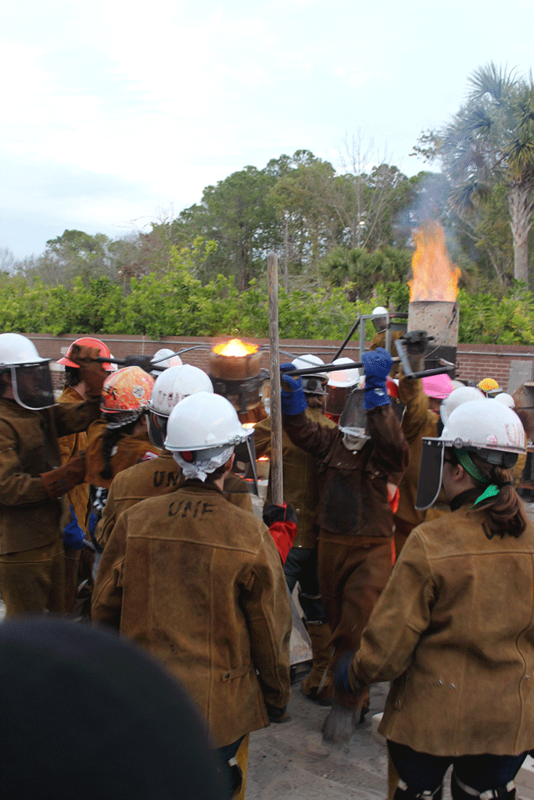 For more information about UNF’s biannual iron pours, or to learn about the sculpture program and how you can enroll, contact Jenny Hager, Professor of Sculpture at UNF.